WHCL is back on the air--but (owing to the sports schedule) I'm not. Nonetheless, I'm posting yet another delightful internet-only RADIOLA! on Live365 to keep the content fresh. I even set up an impromptu home studio to get the job done. You may notice a hint of frustration here, also--this too shall pass. UPDATE (from press release): Don't miss Al Gallodoro's live WAMC Northeast Public Radio performance on PERFORMANCE PLACE (a segment of ROUNDTABLE), Monday February 4th. Be sure tune into the show early and enjoy ROUNDTABLE, as Al's segment begins after 11:15 AM ET. (And you wouldn't want to miss it!) He will be playing with accompanist JoAnn Chmielowski, and interviewed by WAMC's Andy Clegg. THE AL GALLODORO QUARTET with piano accompanist JoAnn Chmielowski, Ryan Cirbus on Bass, and Lou Colone on drums appear at SEGO CAFE, 291 MAIN ST, Oneonta, New York. For Reservations call 607-432-0228. At 94 1/2 years young Gallodoro continues to thrill his listeners with his impeccable musicianship and incredible mastery of his instruments. His admirers include more than just saxophone aficionados--he recently appeared twice at Cornell University 's Weill Medical College for concerts AND as the subject of an extensive interview on longevity and vitality. TWO NEW RECORDINGS IN THE WORKS! Gallodoro was called upon in April 2006 to perform George Gershwin’s Rhapsody in Blue with the NYC Harmonie Ensemble under conductor Steven Richman. 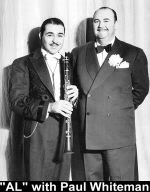 The Rhapsody in Blue is a piece for which he holds the distinction of a world’s record--over 10,000 performances throughout the 1930’s and 40’s with the “King of Jazz” Paul Whiteman. Mr. Richman's release of this Gallodoro 2006 performance of Rhapsody in Blue is now in the works, we will sent you a release date in a future e-mail! Also check Al's website www.algallodoro.com for a preview of Al's soon to be released new CD: Moment in Time (Birmingham Live 1969). You will be treated to a melodically dazzling evening of saxophone and clarinet. Here's another Live365 presentation to break up the January gloom, consisting of some of the best-loved "files" on my hard drive. ("Send me a file" is a nod to all those music collectors who accumulate their treasures electronically, and without recourse to such archaic detritus as records, tapes, and CDs.) I should be back on WHCL next Friday at 8 PM ET, assuming all goes according to schedule. Carmen is a jazz guitar legend (playing music slightly more modern than you will hear on RADIOLA! ), in addition to being a wonderful guy. He scheduled a rare gig to play for my wife and myself on our 10th anniversary. CLARIFICATION: Even though ASV Living Era has been put out of business by the corporate greedheads at Universal Music Group, I need to stress that before you go "stealing" Living Era CDs you should make every effort to purchase them (new or used) from small, independent music dealers who sell through eBay, Amazon, etc., since they really need your monetary support and encouragement. Buying from your local record store (if any still exist in this iPod-blighted land) is better yet. Only if the Living Era CD you are looking for is not available by any other means should you start mooching home-burned copies from your collector friends. And this applies only to Living Era and other defunct labels, not current reissuers who are struggling to stay alive amid this "send me a file" mentality. If you stop buying, they'll stop producing. So spend a buck. The show is now in rotation on my Live365 station.